Gold-leaf letters announce that the portrait is of “Sir Brian Tuke, fifty-seven years of age”. As if the words were spoken, his family motto “Upright and Forward” surrounds him like a garment. 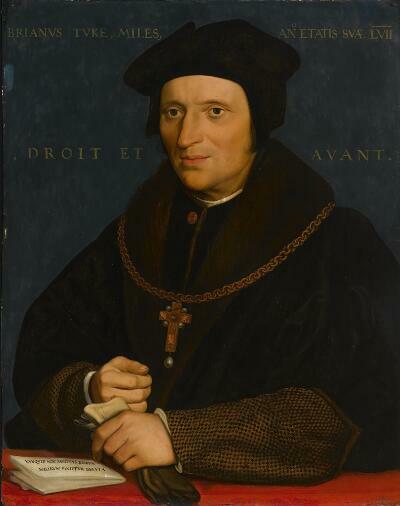 The folded letter on the table bears words from the Book of Job (10:20): “Are not my days numbered?” Tuke (d. 1545) was the Secretary and lifelong advisor to King Henry VIII; among other notable achievements, he established England’s postal system. This portrait is one of six extant versions that share the same composition and dimensions. The presumed original from c. 1530, by the German artist Hans Holbein the Younger, is probably the one that today hangs in the National Gallery of Art in Washington. Scientific analysis of the wood upon which the Pasadena work is painted revealed that the panel was cut from a tree felled in 1616; therefore the painting dates to nearly a century after Holbein’s death in 1543. Holbein was known to make preparatory drawings for some of his paintings, which his workshop then re-used to make copies. While no drawing for this portrait is known, microscopic examination of the panel reveals that the outlines of the figure were incised, which suggests that a pattern transfer may have indeed been used here. The earliest dated reference to the Pasadena painting is 1678, when a traveler saw it displayed in the home of Robert Sidney, the fourth earl of Leicester, in Kent. It remained almost two and a half centuries in that family until it was sold in 1915. The Duveen firm handled the painting twice, first in 1923 and then again in 1959, when it was deaccessioned from the collection at the Cleveland Museum of Art. Robert Sidney, Lord Lisle, in 1678. Robert Marsham Townshend (1834-1914),“The Sydney Collection,” sold by the executors of the Hon. Robert Marsham Townshend, Viscount Sydney (sale, Frognal, Chislehurst, Kent, Knight, Frank and Rutley, 7 June 1915, lot 11). [Lord Joseph Duveen of Millbank, London, and New York, by 1921].